We're looking for a person to come and work with us! We are seeking a self-motivated, reliable, enthusiastic person to work within our Team. The successful candidate should be able to work alone and with the team as well. 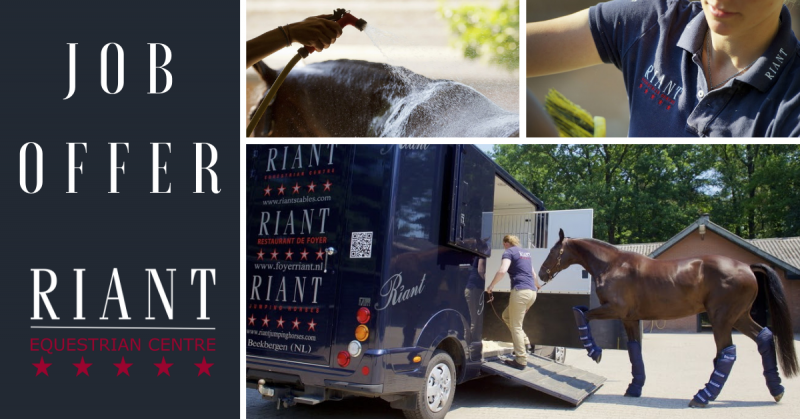 He/She will work for Riant Equestrian Center in Beekbergen, along with Mieke Van Tergouw and Claudio Fumagalli, a well-known stable in the combined driving sport on the top FEI levels. The following job duties are included: General stable work (mucking out), general horse care such as feeding, washing, clipping, mane pulling, bandaging, plaiting. Training assistance and general duties to keep the horses in the best condition. Be a hardworking, flexible individual with a passion for horses and Driving sport. Be reliable, self-motivated and enthusiastic. Be able to work in a team and share the passion of horses. Be able to work in a professional environment. Experience and exposure in the driving sport at top FEI levels.